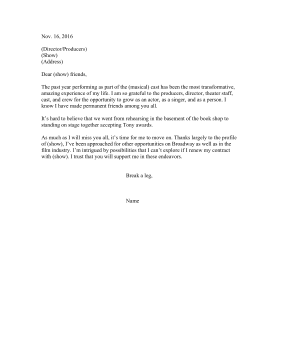 Stage actors who perform professionally can use this letter to resign from a show or decline to renew a contract. The past year performing as part of the (musical) cast has been the most transformative, amazing experience of my life. I am so grateful to the producers, director, theater staff, cast, and crew for the opportunity to grow as an actor, as a singer, and as a person. I know I have made permanent friends among you all. It's hard to believe that we went from rehearsing in the basement of the book shop to standing on stage together accepting Tony awards. As much as I will miss you all, it's time for me to move on. Thanks largely to the profile of (show), I've been approached for other opportunities on Broadway as well as in the film industry. I'm intrigued by possibilities that I can't explore if I renew my contract with (show). I trust that you will support me in these endeavors.